1920 – Where Humans Are There Are Buicks – Burra S.A. 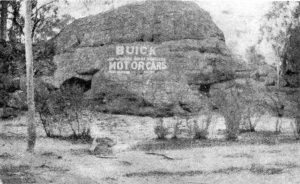 The great popularity of the BUICK Car in the Burra District (South Australia) is evidence from this photograph. The South Australian Distributors for the BUICK (Eyes & Crowle, Ltd,) have a Branch Garage at the Burra, and the number of sales made in that district spell out the success of this Car for station and back country work.